The game sees players choosing from over 70 fighters in four divisions, taking each to the top in level-based fights. Electronic Arts has announced the worldwide release of EA Sports UFC on iOS and Android devices. The game was developed by EA Canada, in partnership with the development team for the EA Sports UFC console game, and features level-based career ladders, as players lead real male fighters from the UFC to victory. The fighting game sees players tapping or swiping on the screen to attack their opponent, draining their health bar in the process. As players successfully land strikes, special abilities become available in the corner of the screen. These moves, like superman punches and hooks, vary for each fighter. Matches are also sprinkled with reflex events, including one for performing a takedown when the appropriate ability becomes available. Once on the ground, players can continue striking, receiving different ability and submission cards (where unlocked) for dealing more damage. Just as each of the game’s fighters has a different overall style (MMA, boxing, etc. ), they each have different stats for health, standup and ground actions. These can be increased by collecting and spending item cards. To be specific, players spend the cards on the fighter’s individual abilities as they see fit, which also increases the fighter’s overall stats in the process. As the overall fighter levels up, additional abilities, submissions and more become available. Gamers earn coins from each fighter’s salary over time, as well as coin rewards after completing fights. As the game focuses on four different divisions (not exactly matching real-world rosters), players can complete four different career ladders, earning up to three stars in each bout, depending on their remaining health. The more stars players earn, the more money they receive, which can be spent on boxes containing new item cards or fighters. 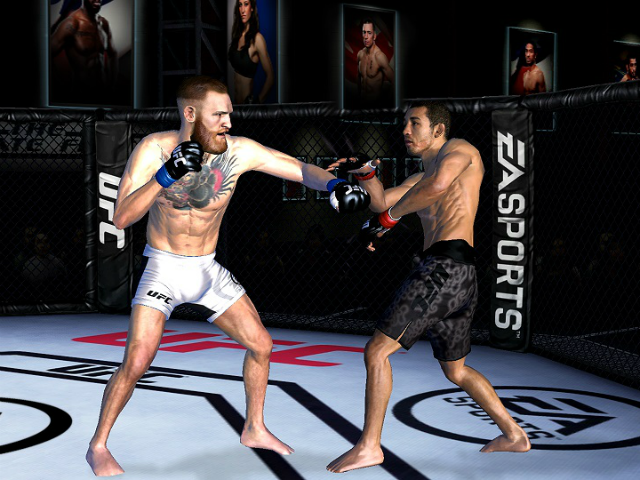 While free-to-play, EA Sports UFC lacks a traditional energy or lives system. Players aren’t penalized for losing a fight, and can play the game as long as they’d like, without waiting for any sort of level-access energy to recharge. It’s worth noting, there is an energy system in the game, but this is a secondary currency, used to temporarily boost the stats of a fighter before a tough fight. In addition to its career levels, the game offers time-limited events relating to real-world UFC events. As players successfully complete these matches, they’ll earn points related to event rewards. During its soft launch in Canada, South Korea, Singapore and Russia, EA Sports UFC was downloaded over two million times in the span of two months, with gamers playing for an average of 36 minutes every day. We are really excited about the early fan feedback and support we’ve received, and now even more people around the world can experience the best in class visuals and immersive gameplay that set a new bar for mobile and tablet fighting games. Combined with intuitive touch controls, this is the ultimate vehicle to transport players of all skill levels into the heart of the action, bringing all the emotion and intensity of a fight to life wherever they are. EA Sports UFC is now available to download for free on the iTunes App Store and Google Play.